Mark Hamill may be front and centre of much of the buzz surrounding Star Wars: The Last Jedi but the actor isn’t so sure of Luke Skywalker’s place in the universe anymore; something that stems from an apparent original reluctance to return to the galaxy far, far away in the first place. “It was scary. I thought, ‘Gee, it was hard to catch lightning in a bottle the first time. I don't know if this is such a wise idea,’” recounted Hamill when talking to The Vancouver Sun about being asked to return to the Star Wars franchise. Thankfully, the space dust has settled and he’s focusing on Luke’s upcoming fully-fledged return to Star Wars after his wordless cameo in Star Wars: The Force Awakens. And make sense of it he did, as Hamill recalls, "Luke changed, I think, more than the other characters in the original trilogy, from callow farm boy to a Jedi in training to finally a Jedi master. What you're talking about is what really fascinated me. Between Return of the Jedi and Force Awakens, there's just decades of history that's unknown." 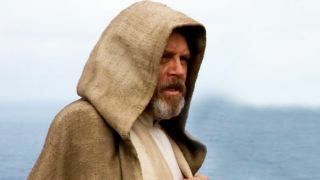 The Star Wars 8 trailer certainly has Luke as acting more like Hamill's vision of a well-rounded character who has lived a considerable life than a periphery figure but, as both real-world and fictional events have shown, Star Wars can (and will) move on from the loss of important figures in the mythos. Judging by his words, it sure sounds like Hamill is at peace with leaving his character behind at some point in the near future.